Hydrocephalus literally means "water brain". It means that there is more spinal fluid than normal in the "ventricles" -- fluid containing chambers within the brain. Persons with hydrocephalus often complain of headaches and unsteadiness. They may also have visual disurbances (enlarged blind spot) due to papilloedma, tinnitus, aural fullness, and low frequency hearing loss, resembling Meniere's disease. The inner ear symptoms are also found in persons with low CSF pressure, such as CSF-leak. Spinal fluid is generated mainly by the choroid plexus -- vascular structures within the lateral ventricles. Spinal fluid is transmitted through the 3rd and 4th ventricles, and is absorbed through the arachnoid granulations -- vascular structures in the lining of the brain. Most commonly, hydrocephalus is due to a "plumbing problem" -- too much spinal fluid, narrowing of passages between the ventricles, or plugging up of the arachnoid granulations. 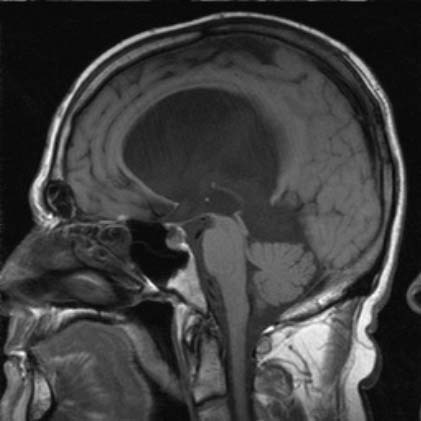 obstructive hydrocephalus -- a tumor or other structure is blocking fluid transmission -- for example, a tumor of the cerebellum or a colloid cyst (see below). How does Hydrocephalus cause dizziness and/or unsteadiness ? Headache pain from hydrocephalus might trigger migraine associated vertigo. Regarding the hearing symptoms, oddly enough, tinnitus and low frequency hearing loss also is found in persons with low CSF pressure. One would think that either there is some mistake in attributing hearing symptoms to these conditions, as tinnitus is a common human symptom, or a shared mechanism (such as Migraine), that accounts for some of the symptoms. Coronal view (white in center is fluid) Sagittal view (black in center is fluid) Axial view (black in center is fluid). 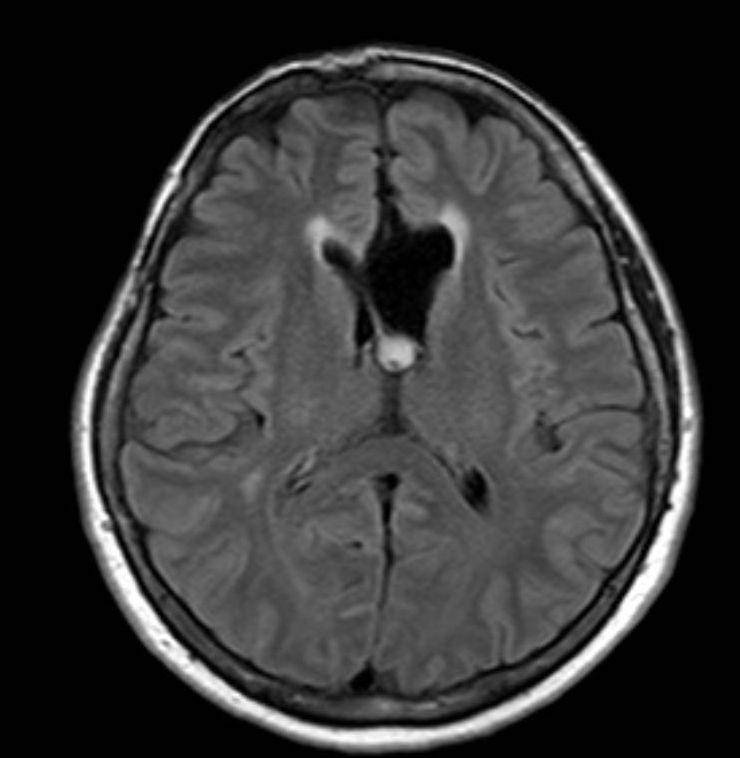 The diagnosis of hydrocephalus is mainly based on imaging studies -- CT scans or MRI scans. 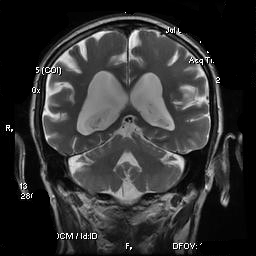 Someone with hydrocephalus should have large ventricles, as shown above on three views. Depending on the MRI sequence, fluid will be white (on T2) or black (on T1). Either method is sufficient to diagnose hydrocephalus. Sometimes there is a worry that the shunt is malfunctioning, and a shunt study is done. This involves injection of dye into the shunt tubing, and taking an X-ray to see where it went. There is a line of dye on the left side (right body side) of the image above. Colloid cyst itself (white structure in center) Hydrocephalus from colloid cyst. 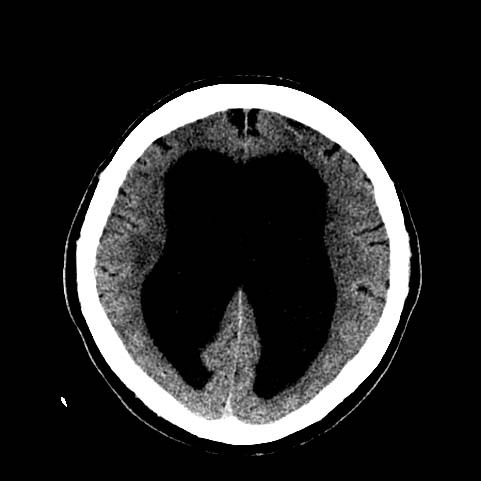 Colloid cysts are an unusual cause of hydrocephalus. They are benign growths in the 3rd ventricle. These cysts can cause intermittent symptoms as they can obstruct the flow of CSF on an intermittent basis. The scans above are from a patient who presented with brief spells, lasting 5-10 seconds, of a jumbling sensation, accompanied by unsteadiness and trouble seeing to the left. She did not present with a headache at all. She was scanned because of the unusual nature of her symptoms, but with the thought she might have migraine. Of course, this turned out to be wrong. Because of the hydrocephalus, she was operated, as there is a danger of sudden death from these entities. At the the present writing, 2010, there is a preference for "programmable shunts", that allow one to adjust a valve in the shunt from the outside. Shunts can become infected or plugged up. There is a tendency to blame almost any head-related symptom on shunt malfunction. 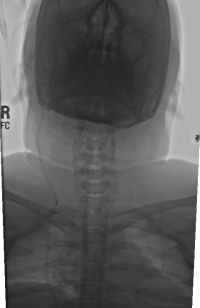 Shunts are frequently revised over and over again. Some authors have suggested use of ventriculostomies, and endoscopic techniques. (Psarros and Coimbra, 2004; de Ribaupierre et al., 2007). It would seem to us that this method might be more difficult to regulate than the programmable shunt. Not all hydrocephalus is treated -- for example, if hydrocephalus is discovered in adulthood, but it started in childhood, often no treatment is advocated. Mechanical systems nearly always eventually fail, and shunts are no exception to this general rule. One must also be realistic. Shunts are crude compaired to the normal brain that has feedback control mechanisms. In other words, no matter what method is used to treat hydrocephalus, lacking any intelligence (and we have no computerized shunts as yet), it cannot function as well as a normal brain. It seems highly unlikely that the pressure fluctuations in the ventricles after a shunt, are as well controlled as pressure fluctuations in a normal brain. It follows that in a person with a shunt, there will likely be some gradual long-term damage to the brain associated with pressure fluctuation. 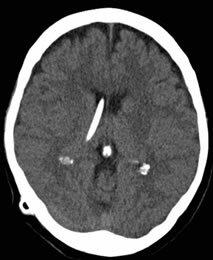 Of course brain neurosurgery of this type intrinsically involves making holes in the brain, and at least some local damage along the catheter "tract". Shunt infections are common problems. Unusual/emerging treatments for hydrocephalus and increased intracerebral pressure -- we think these treatments need close oversight and should not be initiated by radiologists or neurosurgeons. A recent development in medicine is the training of many interventional radiologists or neurosurgeons who are capable of inserting "stents" into blood vessels. These individuals insert stents into cerebral veins, with the goal of increasing the size of cerebral veins, improving the drainage, and therebye pulling blood out of the brain. This procedure is used in patients with Ehlers-Danlos syndrome (a cause of highly flexible joints), Chiari, and idiopathic intracranial hypertension. (Patsalides et al, 2018; Kanagalingam and Subramanian, 2018). It does make sense that if there is significant stenosis of the venous sinuses, CSF pressure might be increased. Of course, stenting treatment is only intiated if there is narrowing of venous structures in the head, and thus this treatment is only considered after an MRV is done. Logical questions remain however : It is very difficult to see why stenting would be used in Ehlers-Danlos in as much as there is no literature in Pubmed on increased intracranial hypertension and Ehlers-Danlos. One would think that EHD would cause increased flexibility of the posterior fossa, and symptoms perhaps of dizziness, but not increased CSF pressure. It is also difficult to see why this would be helpful in Chiari patients who have no reason to have venous disturbances. Overall, as of 2018, we think intravenous stenting is a promising approach for certain types of intracranial hypertension, but also that it may be a "growth" area in medicine that is being abused. There are certainly gigantic numbers of "treatments" for various dizzy conditions, that are simply wishful thinking. In the USA, our health care system is a pay "whatever it takes", which results in gigantic economic incentives and distortions. We think that stenting is best is best reserved for individuals with papilloedema documented on OCT, or increased ICP on lumbar puncture. In other words, we don't think it is such a good idea for people with vague headaches and some thinking issues to "google" increased intracranial pressure and then go to visit a young and aggressive interventionalist at some academic medical center. We also think that stenting decisions should not be made by the person/institutional system hoping to be paid to do the stenting, but rather by a Neurologist who is overseeing the case, located at another institution than the interventionalist planning to do the procedure. 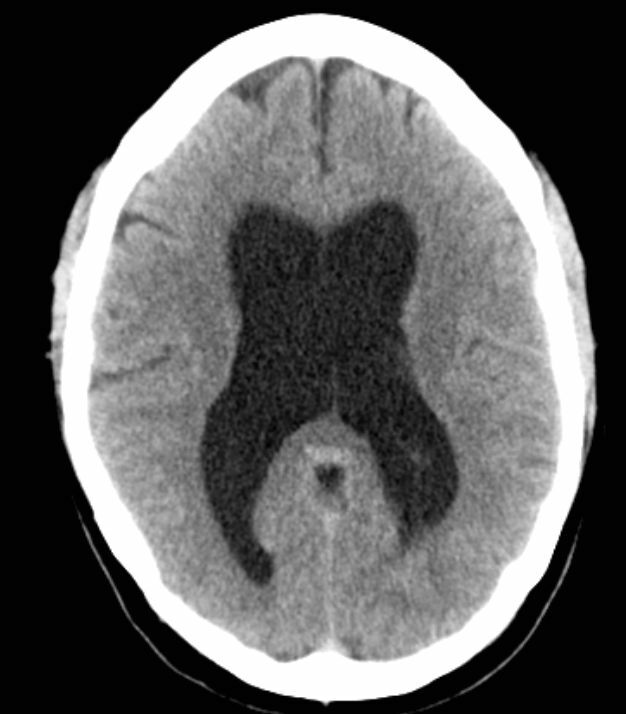 The Neurologist should agree that there is increased intracerebral pressure (either from OCT or lumbar puncture), and should also agree that there is sufficient intracranial venous stenosis to proceed. Without this oversight procedure, we would worry about inappropriate surgical procedures. Arriada, N. and J. Sotelo (2002). "Review: treatment of hydrocephalus in adults." Surg Neurol 58(6): 377-384; discussion 384.
de Ribaupierre, S., B. Rilliet, et al. (2007). "Third ventriculostomy vs ventriculoperitoneal shunt in pediatric obstructive hydrocephalus: results from a Swiss series and literature review." Childs Nerv Syst 23(5): 527-533. Cardoso, E. R. and S. Galbraith (1985). 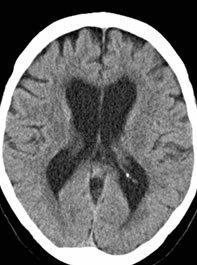 "Posttraumatic hydrocephalus--a retrospective review." Surg Neurol 23(3): 261-264. Constantinescu, C. S., N. S. McConachie, et al. (2005). "Corpus callosum changes following shunting for hydrocephalus: case report and review of the literature." Clin Neurol Neurosurg 107(4): 351-354. Ogata, H., K. Oka, et al. (1992). "Hydrocephalus due to acute aqueductal stenosis following mumps infection: report of a case and review of the literature." Brain Dev 14(6): 417-419. Kanagalingam, S. and P. S. Subramanian (2018). "Update on Idiopathic Intracranial Hypertension." Curr Treat Options Neurol 20(7): 24. Patsalides, A., et al. (2018). "Venous sinus stenting lowers the intracranial pressure in patients with idiopathic intracranial hypertension." J Neurointerv Surg. Psarros, T. G. and C. Coimbra (2004). "Endoscopic third ventriculostomy for patients with hydrocephalus and fourth ventricular cysticercosis: a review of five cases." Minim Invasive Neurosurg 47(6): 346-349. Pudenz, R. H. (1981). "The surgical treatment of hydrocephalus--an historical review." Surg Neurol 15(1): 15-26.